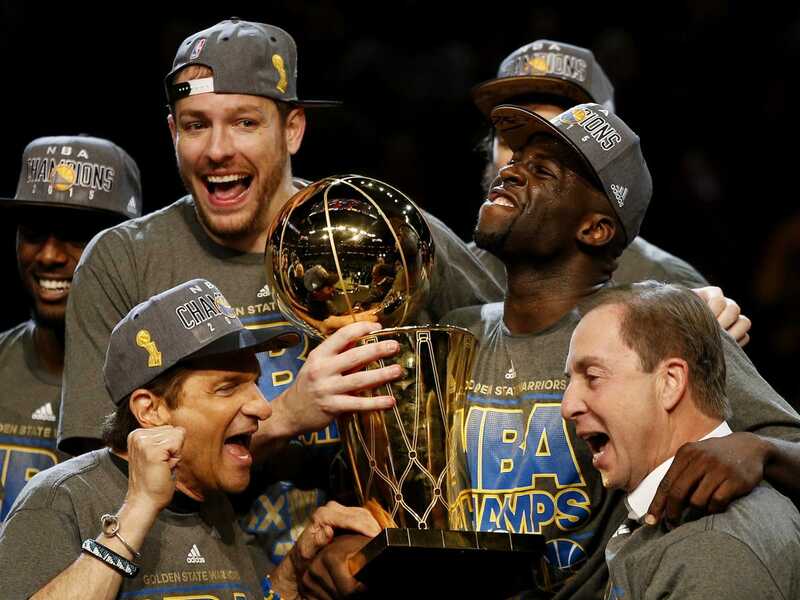 Steve Kerr's Warriors finally put the gold back into Golden State on Tuesday night when the California-based side ended a wait of 40 years to win the NBA Finals in six games. Lifting the Larry O'Brien Championship Trophy in Cleveland's Quicken Loans Arena, it was the solidification they needed to prove the gulf in class in them compared to everyone in the league, and just how good that team is. It was symbolic—Golden State maintained a level of excellence few teams have ever managed in the history of the association, from start to finish they were the undisputed best team in the NBA, and their record that stands tall above the rest along with the championship are the integral landmarks. Hosts on the night, Cleveland Cavaliers won two games in the series, and they were undoubtedly shorthanded—even with one of the best players to ever brace a court, it was an uphill climb from the start, not just due to their injuries which transitioned the "Big Three" into just LeBron James but due to the seemingly infinite scoring outlets, depth, drive and youth of the opponents who defeated them 105-97 to win the Finals. Leading the closely-knit pack is Steph Curry who has enjoyed a spectacular season. Yet despite the efforts which earned him the prestigious Most Valuable Player award for the season, he embodied the team spirit that the Warriors thrive on, and of course their insane shooting from beyond the arc. Klay Thompson made early trails to repay the four-year maximum $70 million contract extension signed in the opening few weeks of the campaign—he didn't wait to explode out of the blocks and the fearsome Smash Bros. backcourt was soon firing on all cylinders above what many could project and make a hot start for the side. Andre Iguodala, meanwhile, may have came off the bench to begin the series but he walked away with the Finals MVP award on Tuesday night, yet again a fitting testament to the depth this team has and the outlets that seem to come from anywhere and everywhere from the postseason and beyond. As some voters would argue, the former Denver Nuggets' forward exceeded the play of Steph Curry in the finals, only matched by LeBron James in terms of registering a vote. Curry had his shaky moments in the culminating best-of-seven series, but like the rest of Golden State, he stabled himself in due course, and they took home the Championship with a game to spare. Through the astonishing execution of the Warriors' shooters and their mesmerising play, it's easy to forget the man tying this all up, Steve Kerr. Smiling brightly, drenched in champagne as he addressed the media following the victory, it was the emphatic conclusion of the beginning—for it was his rookie season, but a season in which he thrived, tapped into the seismic potential of the club and paved the way for future feats to be replicated. You can't forget the others either. There is just so much talent from so many places, this Warriors side can fight for long, and fight good too. Golden State are the closest thing to the NBA's "perfect" Champions—an MVP player, but doing it with a team full of youth and talent, along with a manager who knows exactly what he's doing. The Warriors kept the pace going from the beginning to the end, and now the glory is theirs, and it could be for seasons to come at the way they have performed.